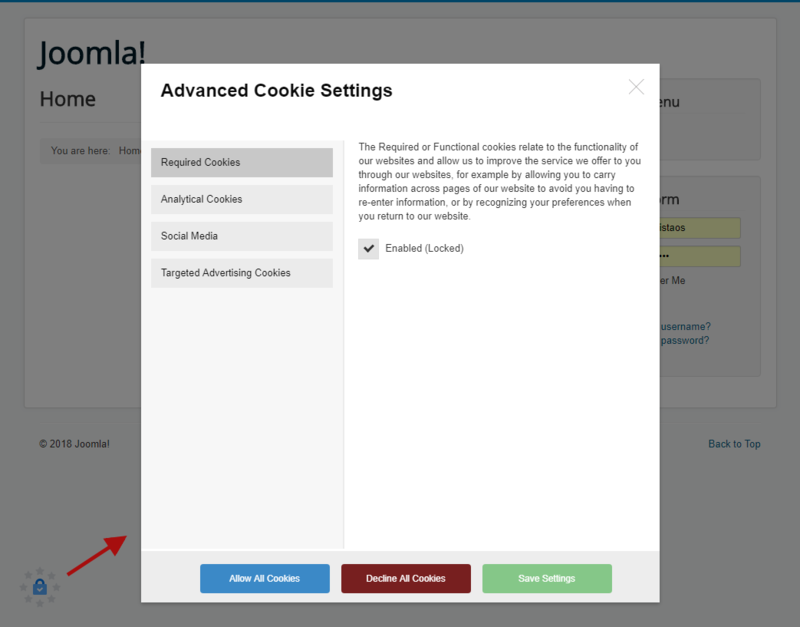 In May 2017, the Block Cookies functionality has been included for the first time in the version v3.1.0 of the Cookies Policy Notification bar for Joomla!. Today, and after a few months of hard work, we are happy to announce the new improved version of the GDPR Ready - Cookies Notification Bar Plugin for Joomla!. The new version is served with many new features and improvements based on the EU GDPR Compliance which has been already implemented on ‎25 May 2018. We would like to inform you that with the latest version of Cookies Policy Notification bar we are ready to meet the requirements of the GDPR. It affects European and non-European businesses using online advertising and measurement solutions when their sites and apps are accessed by users in the European Economic Area (EEA). The latest version v3.5.0 includes the Cookies Manager functionality which allowing users to accept or decline specific categories of cookies. They have the full control of cookies now, and they can change their cookies preferences anytime. Please, before using the BLOCK COOKIES functionality, read carefully the instructions below. So, if you want to block the cookies of these apps before the user of your website accepts the cookies policy by clicking on the confirm button, you just have to follow the below easy instructions. From the Joomla! Backend, navigate to the Extensions > Plugins, and search for the System - Web357 Cookies Policy Notification Bar. Navigate to the advanced settings and ensure that the following parameters are enabled. In the same tab (Advanced Settings), scroll down and find the section "Categories of Cookies". You can insert as many categories of cookies you want. We've added four default categories but you can replace them with yours. Let's take a look at the parameter fields of each Cookie Category. Unique Category ID: This should be unique, and without spaces or special characters. Example: required-cookies, or analytical-cookies, or social-media-cookies. Cookie Category Name: Enter the name of the Cookie Category (Example: Analytical Cookies or Functional Cookies). This name will be displayed in the Cookie Manager (modal window) at the frontend. Cookie Category Description: Enter the description of the Cookie Category. This description will be displayed in the Cookie Manager (modal window) at the frontend. 1. Yes (Locked - cannot change): The cookies of this category are strictly necessary and the User is not able to delete them. 2. Yes (allow change by User): The cookies of this category are loaded by default even if the User has not accepted/declined yet. The User is able to accept/decline anytime. 2. No (allow change by User): The cookies of this category are not loaded by default. The User should accept/decline to load the cookies of this category. The User is able to accept/decline anytime. Status: Choose if you want to publish this Cookie Category at the frontend or not. Let's take a look at the parameter fields of each row. Cookie Category: Choose the category of cookie you have already created on the above section. Name (only for admins): Enter the name of this script. Keep things simple. For example enter something like "Google Analytics", "Facebook like button", "Olark live chat", etc. This name is displayed only at the backend and it is there to help Admins. Status: Choose if you want to enable this script or not. 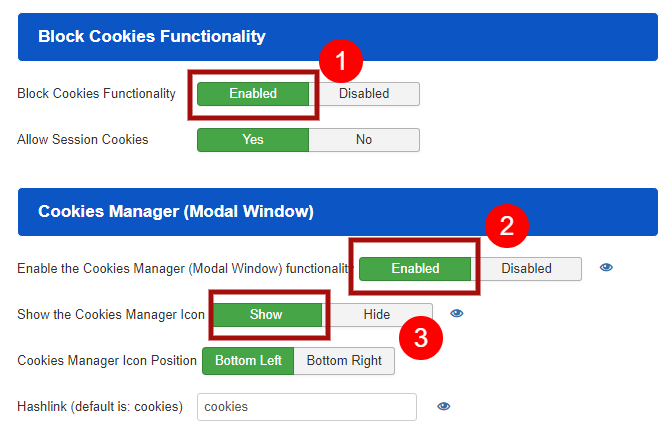 Let's see how the COOKIES MANAGER (modal window) looks at the frontend. You are now able to let your visitors accept/decline your cookies policy, and let them reconsider anytime. Also, the users will be able to accept or decline specific categories of cookies. Hope you found our Joomla! plugin very useful and you'll be happy with the new features and improvements after the major release of version 3.5.0. Do not hesitate to contact us anytime if you want to write us your feedback, or report any issues you've found. view Demo » go to the Download Area » view Plans & Pricing » Need Support?